Edit. I have Vista32 on my laptop, and Win7 (64-bit) on my 2/3D computer. Both MS. After reading the thread through, it seems that staying away from 'Wait' is a smart move on my part as I have no need for a dumbed-down OS. Loving my Windows 8 update. Made an ISO & everything went smoothly. Will post more of my finding & experiences later. BTW off topic a bit. I talked with Cath @ MEC4D tonight (Friday 11/2), and after 5 days, she finally has power back. She like many of us are dealing with the aftermath of Sandy here on the East Coast. but we are both lucky that things are slowly getting back to normal. We should all take a moment & be thankful for the things we take for granted. Mother Nature can turn everything around in a "New York Minute"
This. You are not alone, though I don't have the same medical issues. All this moving the cursor around, gesturing, extra clicks... it's asking for injury among those who must spend hours a day using their machines for productivity. Keyboards don't cause nearly the same strain as a mouse. Evidence for this is that most computer based repetitive strain injuries involve the right hand (usually the mouse hand); whereas, on a QWERTY keyboard, most of the work is done by the left hand. You can reduce your chances of injury by using as many keyboard shortcuts as possible. And now there's an OS that wants you to wave your arms around even more? Yikes. To be fair, there are a lot of Win key+something shortcuts in W8 - one of the complaints in the testing forums was that there were too many, but they should cover most functions. Keeping pressed Alt and then F4 key together goes directly to shutdown choice. 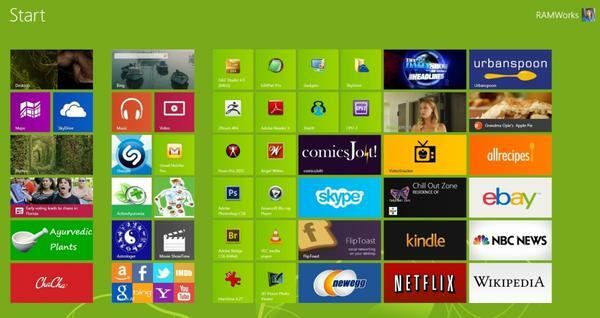 between desktop and Metro interface start screen. Check here to return win8 back to win 7 heaven! Seems MS doesn't realize most money comes from the business sector, and from what I've heard/read, very few - if ANY! - will upgrade to Win8. Most likely they'll go for Win7 when they upgrade from WinXP. Our work computers will certainly not go to Win8 — noises have been made for a little while now about upgrading from XP, but nothing definite yet. Some of the office people have Win7 on their laptops, but I think that might be partly due to the hideous B&D security system we had to use (only recently fixed up to work in Win7). I certainly wouldn't be able to get as much work done in a Win8 system as described upthread: if I wanted to use a tablet OS, I'd buy a tablet. ...they did the same in our workplace. Some have Win7 but Thankfully I still have XP (which I run with "Windows Classic" shell). In a business production environment (that primarily uses software like spreadsheets and WPs) XP is more than adequate. I don't see us going to Win8 anytime in the foreseeable future (at least I hope not). If my experiences with our recent move to Office 2010 are any indication of where MS is heading, Win8 is definitely a big miss. In all the Office 2010 apps, the familiar menu bar has been replaced by this new "tool bar strip" which to say the least is far more cumbersome to use (and thus has a negative impact on productivity). Oh the menus are still there but take an extra click or two to activate. If you accidentally touch the scroll wheel on the mouse while the cursor in in the strip, it changes position to a different function. If you don't notice the change (which is easy to do when working in a high pressure environment like I do) you can get some "interesting" and often irritating results clicking or hitting a key. Many of the hotkeys have been changed, one of the most annoying being the print sequence keystrokes: ALT+F+P+[Enter]. Now it's ALT+F+P+P. which if you do it in another non windows app (like Acrobat) does something completely different. Basically they broke things which didn't need fixing. Finally 2010 office apps take a lot longer to load and change screens than older versions of the software. I estimate that now I lose between 40 min to almost an hour just waiting for the various apps to do something so I can get on with my work. Good policy. You're going to eat a whole day getting familiar with it and tweaking it. I've been playing with the optional "picture as password" feature. It's cool but I'm not so sure it's as secure from prying eyes behind you. With a password you can probably type fast enough that a casual observer won't catch all the special characters and case shifts. However, depending on how you select the three strokes or taps on your picturelocks, a casual observer could easily repeat them. I use a copy of the Hubble Ultra Deep Field photo of zillions of galaxies as my screen background and screenlock image. I specifically chose unique (but not easily seen from a distance) galaxies or groups of galaxies as my targets. The other problem with this is that drawing circles around an object is clumsy with a mouse. Probably much better to use taps or straight lines instead. Circles probably wouldn't be a problem on a tablet interface. You don't have to be super accurate. On a 23" screen the tap spot is about the size of a standard aspirin tablet. Yea, while I'm interested in using the pictogram thing being just me at home I'll probably just go and set up the computer to auto boot in. If I upgrade at work or get a new laptop there THEN I'll probably use a password protection of some sort. I didn't notice any change with my "Desktop". Except for the loss of the "START Orb" and "Gadgets". Desktop shouldn't be a problem, IF you have the upgrade and not a complete new OEM installation. The biggest issues is for administratively minded people trying to find where the hell things like the "Control Panel" and "Computer Properties" went to and how to make quick links to them. Firefox has an option to put "Deskcuts" on the desktop, that functionality still works? I also really wish they would have made sure the dual monitor thing would have been a bit better. What's this, a weirdness in using dual monitors? Is it an annoyance, or a total showstopper? Might be useful as ammunition at the office the nexrt time someone talks about that all-over system upgrade — I'm the only one using dual monitors, but I happen to be the one office (studio/prepress) where it has to work as seamlessly as it does in XP (and, I assume, in 7). Ah, OK then the Win 8 upgrade will not mess that up for me then! GOOD! Ah ha! Right-click on the left bottom corner of the START page and you get a menu with the typical Administrator's tools. But right-click on the left bottom corner of the DESKTOP page and you get a menu which gives access to the computer "Properties". All these new places that are context-sensitive for the left-click function and right-click options. Arghhhh.... :-( I'm afraid to ponder what happens with middle-click in various places! Who was it who thought that assigning hidden functions to keys and mouse buttons was a good idea? Gather 'round kiddies and grampa will tell you of the days when teletypes only used 5-bit character codes, you had only 61 characters (upper case letters only & punctuation) and you had to press (or release) the shift key to switch between them. Now the modern PC keyboard has several levels (caps, Ctrl, Alt, and multi-combinations). Also, complex programs have a long list of keyboard shortcuts that nobody remembers unless they devotedly use that application every day. To make matters worse, the keyboard shortcuts are sometimes configurable. There used to be some standardization of keyboard shortcuts between applications but now the needs of the applications has dictated that they all branch out and define their own key assignments that may or may not have any mnemonic link to the letter on the key. Now we find ourselves in the bizarre situation of assigning multiple functions to empty spaces of display real-estate! (upper/lower/left/right corners, & unused display space) none of which have any visual indication that you have functionality there. I'm sorry, but I miss the days when I typed a two letter command into a clunky old teletype and the computer thought for 10 seconds and then spat back alphanumeric answers. No pictures, no sounds, just useful information needed at that moment. Sent rockets to the moon we did. And the "WEB" consisted of two wires soldered into the motherboards of the two computers at opposite sides of my lab. Security was handled by a key in the door and a close eye on the teletype console. And we had an actual "bit-bucket" under the teletype papertape puncher. And everybody who used computers back in those days was educated. And we all sat around in our bearskins at the mouth of the cave roasting mastodon over the fire after work. Well I'm in... If your upgrading you don't need to worry about a password. Your old settings stay in place, at least that's my experience so far. I did create a new MS username and password but I use GMail so not sure if that's going to be of any help for instant updates with this weird setup. The tiles are OK... the system can not find Photoshop. But Rocket Dock still functions so I can get to it from there so that's a relief. The option to show ALL APPS which is a right click on the Tiles Start area brings up bottom area (which seems really very large for what it contains) has ONE icon in it called Show All Apps. This OS is fine so far but it does feel like it's in it's infancy with how it looks and behaves. Very rudimentary in allot of ways and slick in other areas.... I was able to figure out how to turn off tiles I don't like... if you simply right click on a tile a check mark will appear and another little panel pops up below giving you options... just "unpin" and it will go away. I'm sure there must be a way to add apps in the main line up to set it up to MY liking but not figured that out yet. My desktops look exactly the same. The dual wallpapers are just fine, no adjustments were needed. I think I'm going to try to get my widgets back though. I miss my big clock on the Desktop and a couple of others. Just glad that Rocket Dock works! YAY! ...oh, they've already done that. Colossus or the ZAX mainframe? macA friend of mine is having to support Windows 8 laptops already. He has had the hardest time getting them on the local wireless network. Seems they don't speak WPA 2 correctly. As for Microsoft's direction, given that the revenue Apple generates from the iPhone alone is greater than all of Microsoft, Ballmer is sweating bullets. He has been screwing up since DOS 4. Maybe this will be his last. I think every time I've built a PC and most times I've upgraded a component I've ended up leaving a blood offering to the technology gods. Ended up right clicking on the Mail module and chose "uninstall" and it uninstalled that along with the calendar and messenger service and when I booted in this AM it went right to the desktop bypassing the tiles Start menu. I did go to Stardock and pay them $5.00 to get the Start8 menu and well, my old desktop looks just like it did before the upgrade. The only thing I DON'T like is the lack of being able to change my font system colors and I do miss the rounded corners on the windows as well as hating that stupid Ribbon menu system. YUK! Now I have a handle on the tiles. Once you sign up for the MS account, you don't have to use the email or anything, just gives you access to some of the other portals like the App Store. Found just about all the apps I love on my Samsung Galaxy 10.1 II Tab including the most fabulous radio app that I've got running now called TuneIn.... Tiles you can drag and drop to organize them. Which is really nice. If anyone is troubled by the constant nag and lock screens that come on asking if it's OK for a driver to update or when your installing a program then this page will be of help to you. It shows you were your UAC is located and shows you how to turn off the lock screen nags! In case you like to have the classic windows on windows 8.